Kuwaitis voted in a second parliamentary election in 10 months on Saturday. Voter turnout was the central concern, as the opposition boycotted the elections in a protest against an ‘authoritarian’ change to the electoral law. The polls are currently closed, as Kuwaitis anxiously await the results. Police watched as citizens cast their votes, RT's Lucy Kafanov reported from Kuwait. Army personnel and police officers were prevented from taking part in the election. Opposition activists believe this election is an attempt to produce a more compliant parliament that will allow the government to pass laws without appropriate oversight from the legislatures. The new amendment to the electoral law has reduced the number of candidates a voter is eligible to pick from the maximum of four to one. 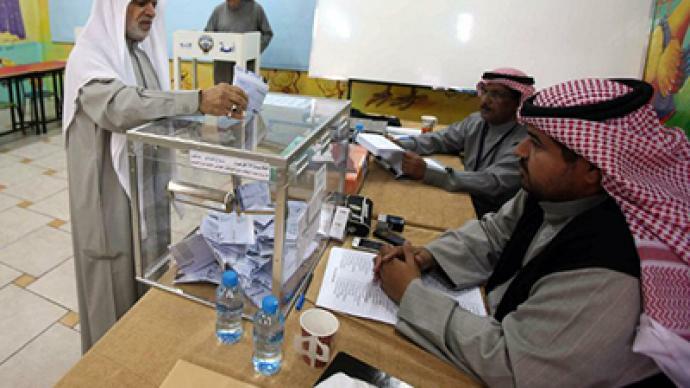 Each of Kuwait's five constituencies elects 10 lawmakers. The opposition hoped that election boycott would result in a lower voter turnout, which in turn would undermine the actual outcome of the elections. Official voter turnout results are not yet available, but some opposition groups predict turnout could be well below 50 per cent. 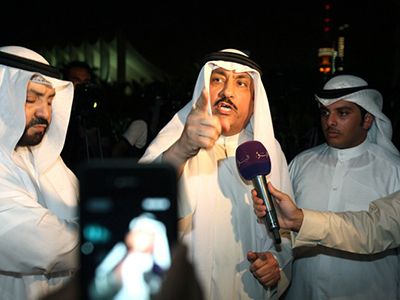 Walid Tabtabai of the Islamic opposition said more than 80 per cent of Kuwaitis were boycotting the election. "We have passed by the polling stations and found them empty," he told AP. Prominent opposition figure and former MP Faisal al-Muslim said on his Twitter account that turnout was around 17 per cent, three hours before the polls were due to close. A number of opposition figures also said that some voters were given two ballot papers in a bid to create the appearance of a higher turnout, AFP reported. The turnout percentage is key in determining whether the election is successful or not. Opposition activists stationed their own observers at each of the polling stations in order to do an independent count of the voter turn-out in fear that the government could inflate the numbers, Kafanov said. Interesting facts to note about the elections are that there were separate centers for men and women set up among the 100 polling stations in schools, where the voting took place. Also, none of the opposition members were among the 306 people on the ballots. On top of that, of the 3.8 million people living in Kuwait, only 422,000 people were eligible to vote in the election, since 2.7 million are foreigners and the others fall outside of the eligibility criteria. The voting age in Kuwait is 21, and 54 per cent of the electorate is women. 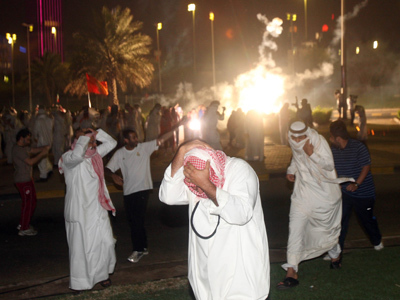 The election comes at a time of ongoing political unrest in the oil-rich Gulf state. On the eve of the election, tens of thousands of protesters took to the streets in largely peaceful protests in order to express their frustration towards the electoral law change that they see is corruption at the top, as well as the subversion of the rule of law. 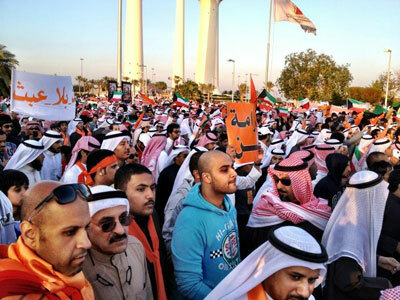 In Kuwait City, demonstrators carried banners that read "absolute power corrupts" while chanting, "we are boycotting." The country’s emir, a member of Al-Sabah family that has ruled Kuwait for 250 years, has scrapped the parliament four times since 2006. 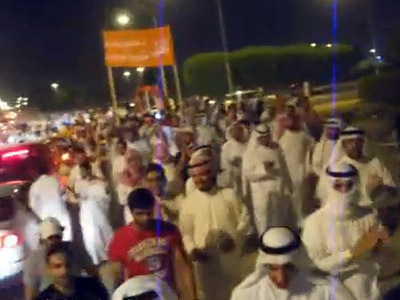 Since late October, several mass protests have broken out in Kuwait. As the government pronounced these demonstrations illegal, they were cracked down on by police using stun grenades and teargas. More than 150 protesters and 24 police officers have been injured in violent clashes. Kuwait is located at a strategic geopolitical location. It sits on 10 per cent of global crude reserves, pumping around 3.0 million barrels of oil a day, and is home to three US military bases.